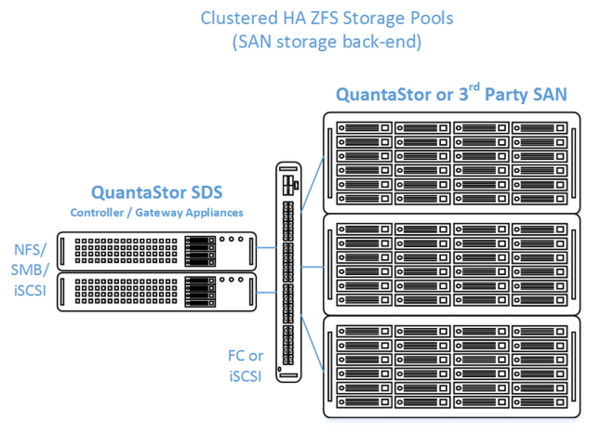 QuantaStor's clustered storage pool configurations ensure high-availability (HA) in the event of a node outage or storage connectivity to the active node is lost. 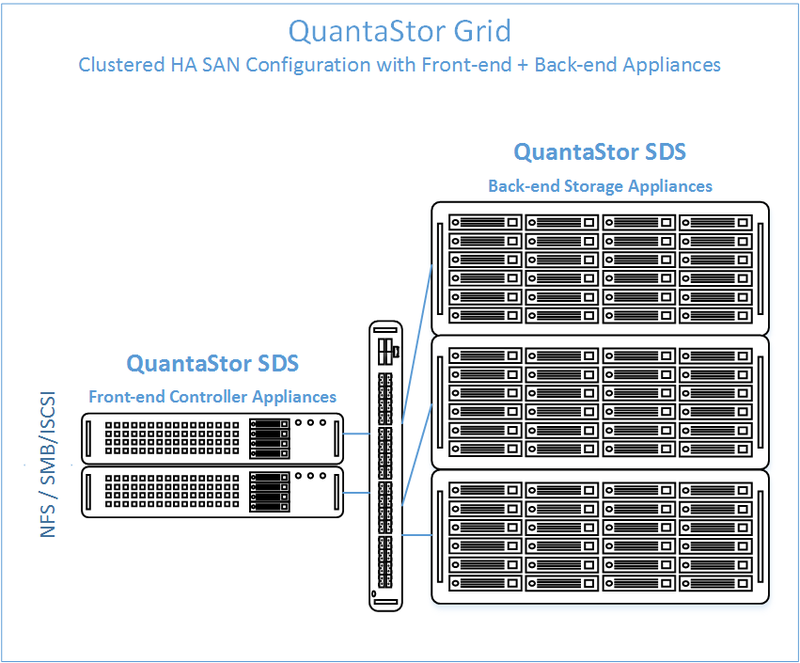 From a hardware perspective a QuantaStor deployment of one or more clustered storage pools requires at least two QuantaStor systems so that automatic fail-over can occur in the event that the active system goes offline. Another requirement of these configurations is that the disk storage devices for the highly-available pool cannot be in either of the system units. Rather the storage must come from an external source which can be as simple as using one or more SAS JBOD enclosures or for higher performance configurations could be a separate SAN delivering block storage (LUNs) to the QuantaStor front-end systems over FC (preferred) or iSCSI. This guide is focused on how to setup QuantaStor with a FC or iSCSI SAN back-end, for information on how to setup with a JBOD SAS enclosure back-end see the guide for that here. Apply a unique QuantaStor license key to each system. 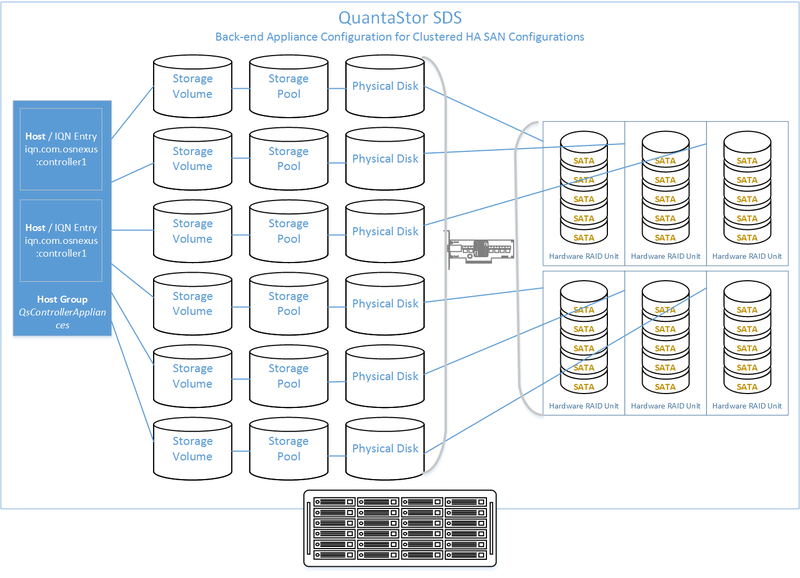 In this configuration the QuantaStor front-end controller systems are acting as a gateway to the storage in the SANs on the back-end. 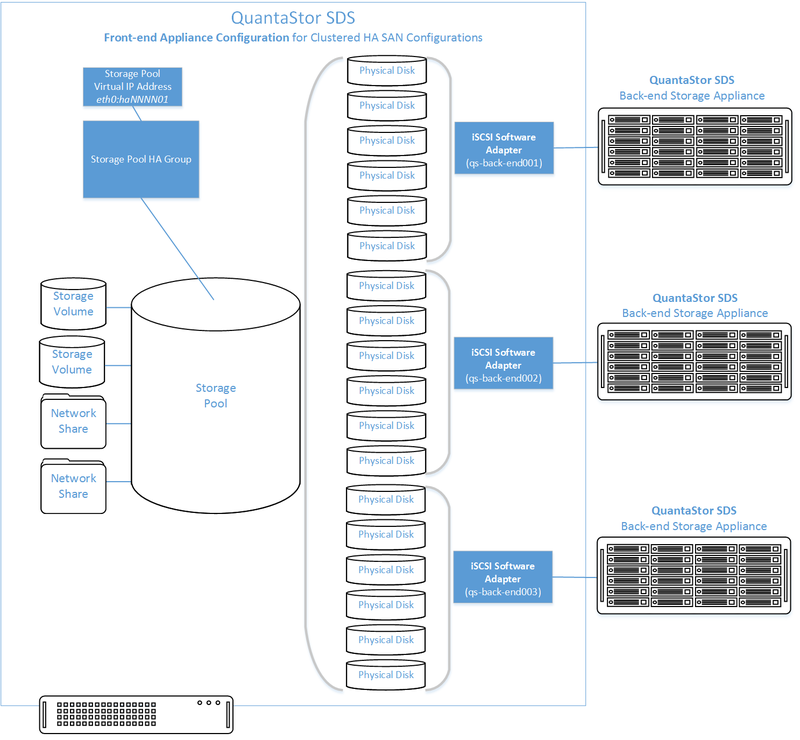 QuantaStor has been tested with NetApp and HP MSA 3rd party SANs as back-end storage as well as with QuantaStor SDS as a back-end SAN. Please contact support@osnexus.com for the latest HCL for 3rd party SAN support or to get additional SAN support added to the HCL. Setup each back-end data node system as per basic system configuration with one or more storage pools, each with one storage volume per pool. Ideal pool size is 10 to 20 drives, you may need to create multiple pools per back-end system. Create Host entries, one for each front-end system and add the WWPN of each of the FC ports on the front-end systems which will be used for intercommunication between the front-end and back-end nodes. Direct point-to-point physical cabling connections can be made in smaller configurations to avoid the cost of an FC switch. Here's a guide that can help with some advice on FC zone setup for larger configurations using a back-end fabric. If you're using a FC switch you should use a fabric topology that will give you fault tolerance. Back-end systems must use Qlogic QLE 8Gb or 16Gb FC cards as QuantaStor can only present Storage Volumes as FC target LUNs via Qlogic cards. It is highly recommended to separate the networks for the front-end (client communication) vs back-end (communicate between the control and data systems). If the back-end systems are in the same grid with the front-end systems, add Host entries with the IQN (or FC WWPN) for each of the front-end systems. These Host entries will be used to assign Storage Volumes from the back-end systems to the front-end systems so that the storage can be aggregated. Assign all the Storage Volumes on the back-end systems to the Host entries for the front-end systems. 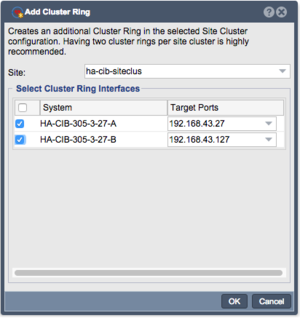 To establish iSCSI connectivity to the Storage Volumes on the back-end nodes, create a Software iSCSI Adapter by going to the Hardware Controllers & Enclosures section and adding a iSCSI Adapter. This will take care of logging into and accessing the back-end storage. Again, back-end storage systems must assign their Storage Volumes to all the Hosts for the front-end nodes with their associated iSCSI IQNs. 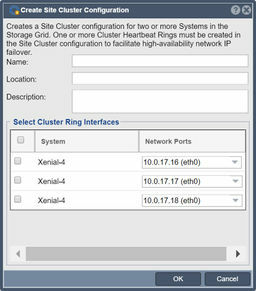 Create the Site Cluster with Ring 1 on the first network and Ring 2 on the second network, both front-end nodes should be in the Site Cluster, back-end nodes can be left out. This establishes a redundant (dual ring) heartbeat between the front-end systems which will be used to detect hardware problems which in turn will trigger a failover of the pool to the passive node. 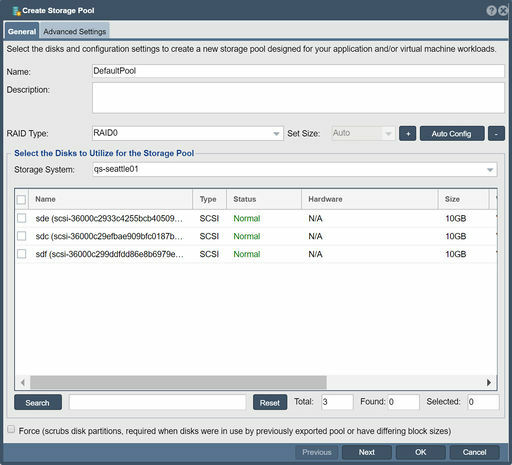 Create a Storage Pool on the first front-end system (ZFS based) using the physical disks which have arrived from the back-end systems. 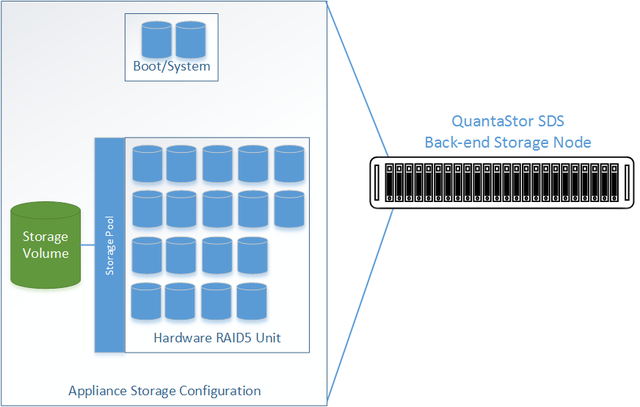 QuantaStor will automatically analyze the disks from the back-end systems and stripe across the systems to ensure proper fault-tolerance across the back-end nodes. 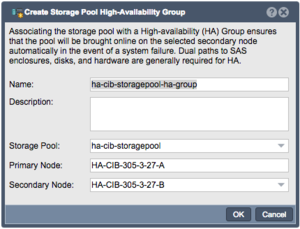 Create a Storage Pool HA Group for the pool created in the previous step. If the storage is not accessible to both systems, it will block you from creating the group. 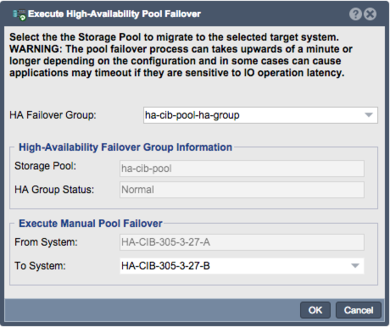 Create a Storage Pool Virtual Interface for the Storage Pool HA Group. 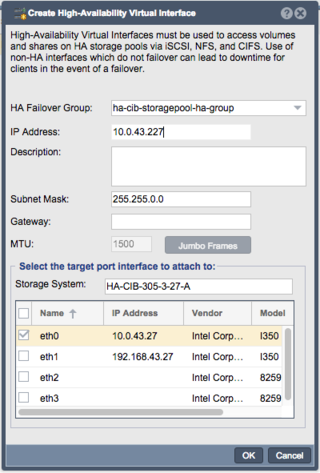 All NFS/iSCSI access to the pool must be through the Virtual Interface IP address to ensure highly-available access to the storage for the clients. 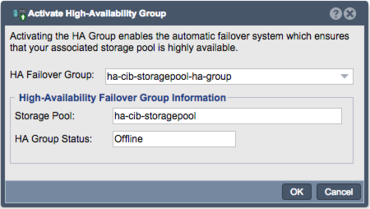 Test pool failover, right-click on the Storage Pool HA Group and choose 'Manual Failover' to fail-over the pool to another node. This page was last modified on 17 April 2019, at 07:27.